The fashion department of the Academy of Fine Arts in Antwerp unveild its latest generation of fashion designers in spectacular flair, proving its relevance within fashion industry education. 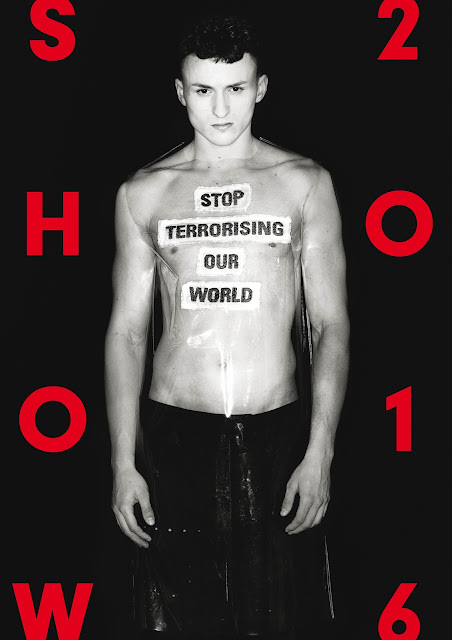 “Stop Terrorising Our World" Antwerp Academy teamed up with the Brussels’ La Cambre. In a show of solidarity with the victims of the March 22 terror attacks in Brussels, the two institutions jointly used a poster featuring Walter van Beirendonck's tunic with slogan to advertise their annual graduate fashion shows. is a very long sit, but it pays off; in both bachelor and master years there is many talent to discover.